Las Vegas is a fairly runner-friendly city, with a wealth of paved routes to help make your run interesting. Still, s ometimes it’s good to get away from the city and the asphalt and try trail running on dirt and natural surfaces. Heading out to the Red Rock Canyon or even the Historic Rail Road trail down at the Lake Mead National Recreation Area is a great way to change up your run and train your feet for a different surface. 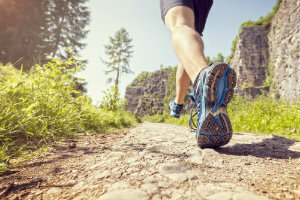 Since trail running is different and tends to involve uneven surfaces, though, you’ll need to take extra care of your feet. A trail for running is really any kind of unpaved surface. This could mean a smooth, dirt road, but in many cases, it means an uneven route. Rocks, ruts, sudden dips, roots, and more can trip you up and affect how your feet hit the ground. Ankle sprains and other injuries could be more likely if you aren’t careful. Wear the right shoes – Rocky and uneven trails are hard on shoes and feet. Make sure you’re wearing footwear that appropriately protects your soles from sharp objects and supports your lower limbs. Do balance training – The best way to avoid twisting your ankles on an uneven trail is to strengthen them. Balance training exercises are great for this. Start slow and short – If you’re brand new to running off-road, start slow and don’t push yourself too hard. Give your feet time to adjust. Remember to watch where you’re going – Keep an eye on the trail to watch for holes and objects that could trip you up. Trail running can be a great experience, but you do have to be more careful on uneven surfaces. Let our team at Absolute Foot Care Specialists help you take care of your feet and ankles so you can enjoy the diverse running opportunities that are available to you. Don’t wait for an injury to force you to hang up your shoes to take care of your feet and ankles. Contact our Las Vegas offices today for more information or a running consultation. Just call (702) 839-2010, or use the online request forms for more information.